You may already have a favourite Italian restaurant in Jakarta, but allow me to introduce you to aTavoLa and try to convince you that this is worth a shot. By the cordial invitation of Mr. Donny Dewanto, aTavoLa's Operational Director, acouple of weeks ago I came to its restaurant in Kemang Selatan with my friends to sample its 4-course Food Testing Menu. While waiting for the others to arrive, we had a short chat with Donny. aTavoLa actually started off in 2005 as an Italian gourmet deli, supplying imported Italian products such as olive oil, herbs, fresh pasta, coffee, cheese, salami, wine and many more. But the passion to expand to more than just a store within just a year after it opened. Beginning with only serving Italian coffee in-store, to a full-fledged Italian ristorante like it is today. The interior is still unchanged, with old orange tile floor and plenty of vintage knick-knacks. Let's begin Food Testing feast! Donny informed us that the manner to enjoy a cheese platter is to start from the softest to the hardest, because soft cheeses presumably taste more delicate than the hard one. 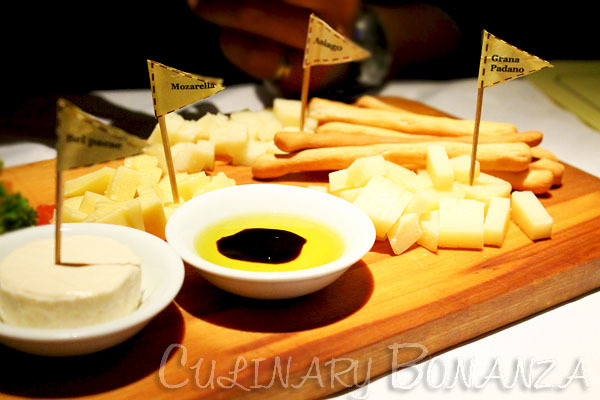 Specifically for the platter served to us, the order of eating should start from Bel paese, Mozzarella, Asiago and Grana Padano. Bel paese tasted smooth and delicate, with light creamy texture. Mozzarella taste just like mozzarella, you know the springy, chewy cheese on top of your pizza. I was quite surprised by Asiago, which tasted slightly spicy, although the cheese is not flavoured or herbed at all. Grana Padano was the hardest of all, with slightly grainy texture. 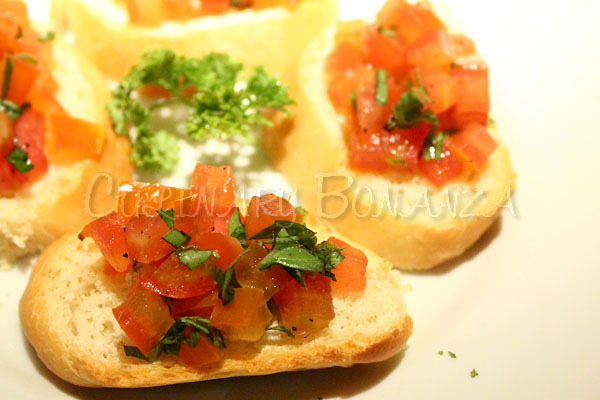 Crispy, thin, savoury bruschettas, to entice the taste buds and made us salivate before moving to the next dishes. 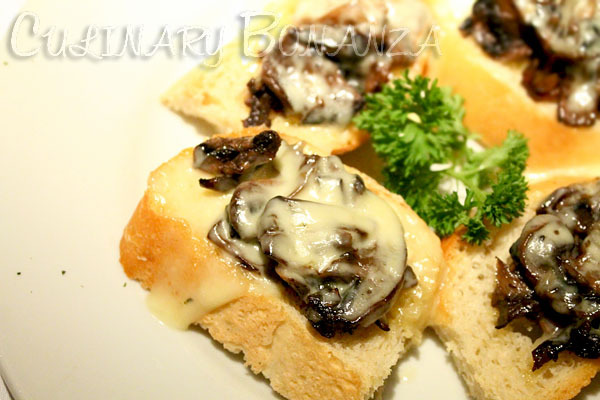 The bruchettas are deliciozo, but since I'm a 'shrooms girl, I'm biased for the Bruschetta Funghi. I always love ravioli. These stuffed pillows can hardly go wrong and aTavoLa did it just right! di Manzo is stuffed with pumpkin, ricotta and beef, served with home made tomate sauce, whereas con Funghi is stuffed with mushroom & ricotta and served with mushroom sauce. Although I'm a mushroom girl, I have to admit that di Manzo was the winner. 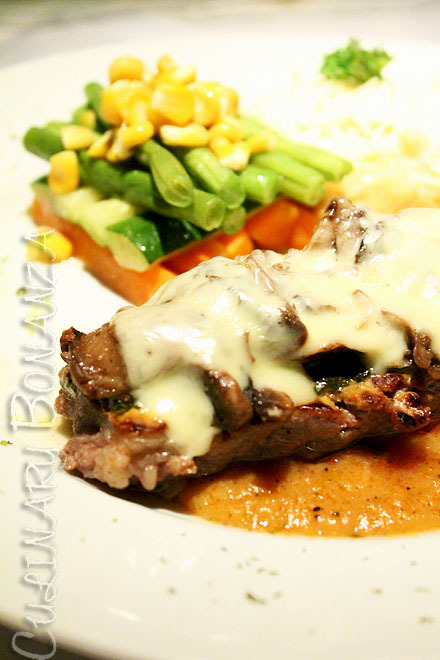 Thin slice of 200gr New Zealand sirloin baked with Italian herbs, mushroom, mozzarella cheese. 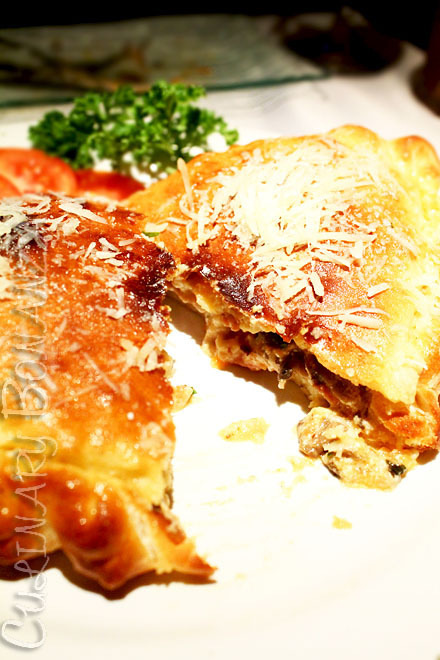 Rolled chicken breast filled with mozzarella cheese and beef pepperoni, served in creamy mushroom sauce. Crispy oven baked pocket pizza filled with tomato sauce, mushroom, basil, beef pepperoni, ricotta cheese, mozzarella & grana padano cheese. 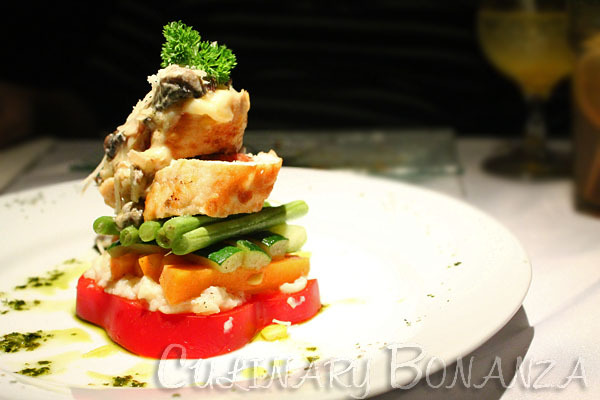 The main course is nicely palatable to the taste buds, right amount of seasoning and combination of texture. Red velvet cake may be outdated now, but aTavoLa still serves it and this one is one of the better versions of red velvet cake. 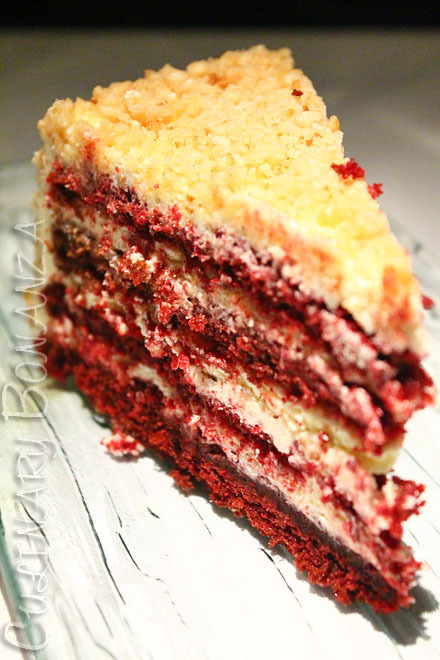 The red sponge is drenched in rhum to create the light texture. Between each sponge layers are generous dollops of light cream, top it all with fresh ground peanut and you get a tasty dessert to end your sumptuous Italian meal. My verdict for aTavoLa is a resounding yes!! The restaurant is intimate (aka: small) so, if you're coming at peak hours, it would be best to call beforehand to reserve a table. 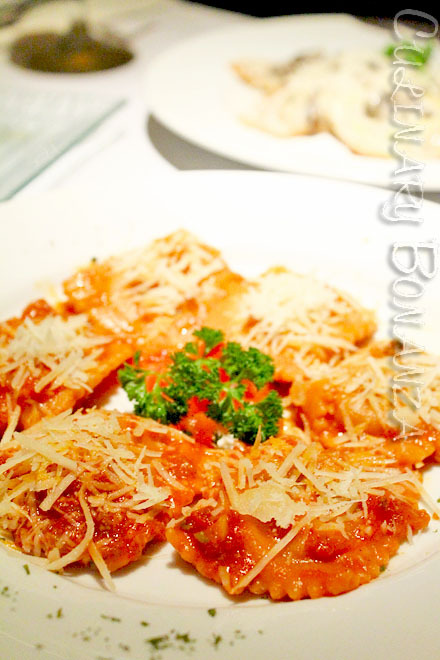 What's even better, the prices of these delectable Italian dishes are absolutely reasonable. My only disappointment is they allow smoking inside, what an appetite spoiler. I appreciate the ideas and this is very nice article and have great information.but Mistrask is also provides best Food testing. Fabulous post !! your post is very informative and impressive.